Early in my career, a close friend told me, “You have the gift of gab. You should be in sales.” Worst. Advice. Ever. Don’t get me wrong, having strong communications skills is essential, but it doesn’t mean you (or I) should be doing all of the talking! And it doesn’t mean sales professionals must be the stereotypical extroverted, people-oriented type so commonly portrayed. Although we frequently are! Everyone has specific and consistent ways they prefer to give and receive information. It’s visible in our behaviors and words. The “trick” (if there is one) is to understand first how you are wired to give and receive information and your associated behaviors. With this insight, we can better understand and appreciate the communication style and preference of others. From here we can adapt our natural behaviors and communication style to a style more suited to the buyers. All of us, to varying degrees, fall into four behavioral types typically with one or two being our primary type and style. Each of these comes with a specific fear, an emotion, something they are looking for, and something they need. 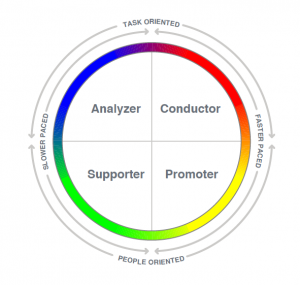 The Conductor: This behavioral persona, also called a Driver, needs to be direct with their communication, looking for results, and fears being taken advantage of. Their primary visible emotion is anger. Bad news. The good news is they are usually quick to get over it. We’ve all likely met or worked for someone like this. They can be a teddy bear or grizzly bear and probably go back and forth between the two. It is common for CEOs and leaders to be this style. The Promoter: Most frequently the stereotypical salesperson I mentioned earlier, this behavioral persona, loves to be at the center of the action, and needs to interact. Not surprisingly their fear is social rejection. The emotion for the Promoter is optimism. Their glass is always half full! The promoter is the easiest style to identify. The Supporter: The quietest and most reserved of the four styles, the Supporter is often difficult to detect as their visible emotion is non- emotional. Said another way, they have feelings like everyone else however, they don’t wear them on their sleeve. They need to serve and are looking for long-term security. The biggest fear for the Supporter is the loss of security both personally and professionally. The Analyzer: This is your facts and figures type. Analyzers are on the lookout for proof and evidence. Give it to them, but make sure it’s right because they’ll check! They need procedures, and in the absence of them, they’ll create some. Their emotion is fear, and the thing they are afraid of is the criticism of their work. You may now be asking how do I know which one I am? And how do I know which one they are? 1) Are you/they more task oriented or people oriented? 2) Are you/they slower paced or faster paced? Conductors are fast-paced and task oriented. Promoters are fast paced and people oriented. Supporters are slower paced and people oriented. Analyzers are slower paced and task oriented. It’s important to note we are all, to varying degrees, each of these four styles but we will have a primary and sometimes a secondary style. The goal here is to gain an understanding of each, identify our primary style, identify their primary style, and then behave (and sell) accordingly. If you determine you’re a Promoter and your prospect is an Analyzer, you’ll need to adapt your behavior and style, or you’ll likely struggle to get very far. The Promoter’s natural tendency to be the center of the action and use generalizations, and dare I say, ”hype” for example, is in direct contrast the Analyzer’s need for meaningful and valid specifics. A Conductor calling on a Supporter can suffer a similar fate if left unchecked. A Conductor’s natural tendency or behavior in a sales role is to present quickly and directly with an expectation of a fast decision. The Supporter will never get there. They move at a more measured pace and struggle when pushed too hard, or at all. If you would like to know exactly what your sales behaviors are, and additional resources for selling to others, send me an email with “Behavior” in the subject line.